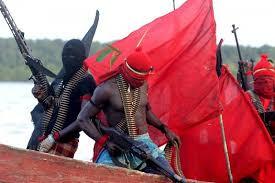 A new militant group, the Red Scorpion, has carried out its threat to blow up oil installations and pipelines belonging to the Shell Petroleum Develop­ment Corporation in Awara, Ohaji/Egbema Local Govern­ment Area of Imo State.The AUTHORITY learnt that the group, which on Tuesday warned that it would destroy the pipelines because of the exclusion of its mem­bers from the Federal Gov­ernment’s dialogue with Niger Delta militants, hit the facili­ties on Thursday. A source close to the lead­ership of the group said the at­tack was a warning that mili­tants in Imo should no longer be sidelined by the Federal Government.The group said that it will continue to attack Shell facil­ities as long as it was neglect­ed by the government. In their Facebook post, the militants had demand­ed that equal rights should be given to all oil-producing ar­eas in the country.The oil installations be­longing to Elf Petroleum in Awara were earlier blown up by the Red Scorpion. Prior to the attack, the Imo State House of Assembly had kicked against the exclusion of the state from the proposed dialogue by the Federal Gov­ernment and the Niger Delta Avengers.When contacted, the State Command Police Public Rela­tions Officer, Andrew Enwer­em, said that the command was hinted of the incident but could not ascertain the extent of the damage. He said: “We got the re­port of destruction of oil installation at Awara, but we are yet to know the extent of the damage.”And as the government grapples with the activities of the Niger Delta Avengers (NDA), the Movement for the Actualisation of the Sover­eign State of Biafra (MASSOB) and the Biafra Independence Movement (BIM) have denied any alliance with the NDA. Their position was con­tained in a statement issued to newsmen in Owerri, the Imo State capital, on Thursday, wherein they told the public to disregard any publication or claim of association between them and the NDA.A statement jointly signed by Chief Okechukwu Nwaogu, a member of MASSOB Elders’ Council and Canice Anojuru, Owerri Zonal Leader of BIM respectively, described as false the June 15 publication by a national daily (not The AU­THORITY) linking them with the NDA. Meanwhile, a former lead­er of the defunct Movement for the Emancipation of the Niger Delta (MEND), Chief Kemei­zompoukomumor Ayuba, has appealed to President Buhari to dialogue with new Niger Del­ta militant groups in the inter­est of peace and national coex­istence. Ayuba, a self-styled found­ing leader of MEND, in a state­ment made available to The AUTHORITY, told the gov­ernment that those opposed to the proposed dialogue were not doing the Buhari adminis­tration any good.